And the reason is simple, mate. Brian loves bananas, and he’d like his friends to like them, too. The problem is – they are piranhas, and they’d prefer to eat knees, feet and even bums. But Brian persists – offering them all kinds of fruit and vegetable treats. Eventually his friends agree to try a fruit platter if he’ll stop his chatter. They do give it a try but, to Brian’s chagrin, even though they do think the fruit is nice, they still prefer bum. 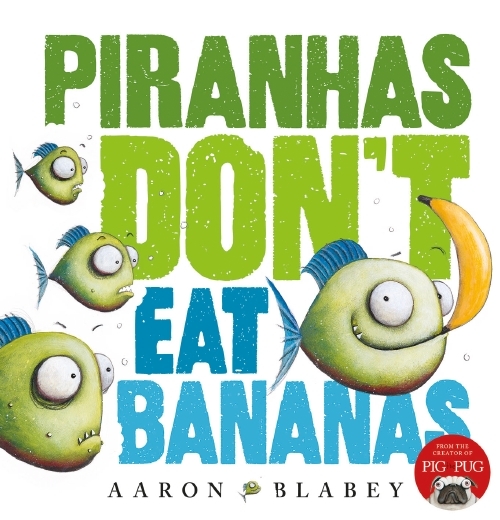 Piranhas Don’t Eat Bananas is a short, silly book which kids will adore. The text consists of dialogue between Brian and the other piranhas, with narration not needed. Blabey’s ability to show so much animation in the faces of the fish – largely through movement of their eyes – is amazing. The rhyming text flows well and there will be giggles at the concept and its execution. Very clever.